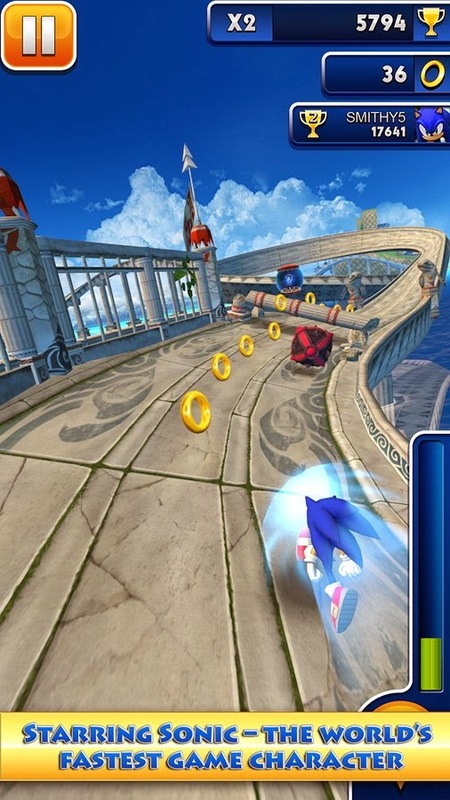 SEGA launches Sonic Dash game for Android. This free to play, endless runner game is developed by SEGA's Hardlight Studio, the creators of Sonic Jump. "Whenever we've talked about Sonic Dash, someone has asked when it will be released on Android," said Hardlight CTO Chris Southall. "This level of enthusiasm made it very easy when deciding to create the Android version." Get ready to feel the speed on Android like never before, as Sonic runs, jumps and spins his way through rolling hills, perilous temples and scorching sand dunes. Sonic Dash brings high speed, frenzied fun as players complete missions to increase their score multiplier and battle it out for leaderboard supremacy. With daily challenges, multiple playable characters, deep social integration and Sonic's unstoppable dash ability, you can find out for yourself how far the world's fastest hedgehog can run. To celebrate the release, Sonic Dash will be holding an exclusive Android score multiplier challenge event this weekend. From November 29th-31st, players taking part will receive a game-wide bonus to their score multiplier, giving them an edge to help rise up their friend's leaderboards.